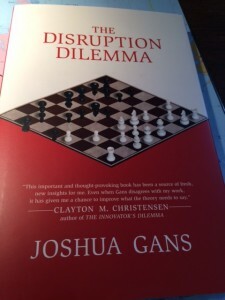 Aha, The Disruption Dilemma by Josh Gans has just arrived at Enlightenment Towers. Looking forward to this one. It promises to tell businesses how to deal with disruption, so in principle it has a large market! Along with it, The Sharing Economy by Arun Sundararajan, which is due out in June – also looks very interesting.